Do you know the actual definition of being obese? Don’t you think it means weighing too much for your height? In actuality, being obese is not just about how much you weigh. 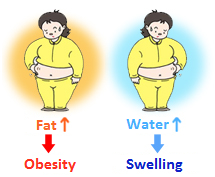 The fact is that being obese means your fat ratio in comparison to your body weight is abnormally high. The largest component of our bodies is water, including blood, which amounts from 50-60% of our body. The next biggest element is fat which amounts from 15-25% in the average male body and 20-30% in the average female body. The rest of our body’s components include protein, minerals, fructose, and so on. Our bones also include lots of proteins and minerals such as calcium. 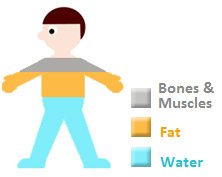 We start to gain weight when fat or water increases in our bodies. When fat increases, it can lead to obesity. When water increases, it is only swelling. Visit japanese3weekdiet's profile on Pinterest.